$33 to $100 and then do nothing and make a killing. How much will you get paid for doing nothing? How does $35,000 on a $33 investment sound. Or how does buying 1 property for $50 and making $7,000 doing nothing sound? Or buying one for $100 and making $15,000 doing nothing? 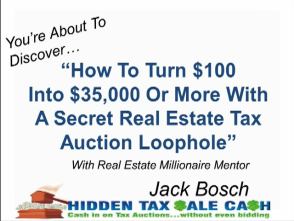 And in this video you can also find out how you can get 2 free seats to my next $2000 Live seminar (again that is for FREE). Try me by watching the Presentation right now here! Watch it now before I take it down. I sent two questions. How will I know the answers? I saw your presentation and I spoke with my RE attorney who warned against sending a letter to a homeowner that could be miscontrued and open me up to later law suits. He has asked that I request a copy of your letters for his inspection before buying any $800.00 training. Hi, unfortunately we can’t make our documents available without you purchasing the program. But remember, sending a letter is part of your 1st ammendment rights (freedom of speech). you won’t go and sue Walmart or Target for sending you a postcard asking you to come and buy something. so the person you send a letter can’t sue you for you sending them a letter asking them to sell their property. you are not forcing them to do anything you are just asking them to sell their property!! But if you are concerned I would definitely want you to check it out with your attorney. that is amongst other things what the 30 day money back guarantee is for. so you can get the program, check it out and if you don’t like it or don’t think it works, send it back for a refund within the 30 days.